My husband loves, loves, loves raviolis. Even certain veggies that he does care for (e.g. mushrooms), he'll eat in raviolis. Hmmm, I wonder if I could put roasted beets in them? Anyway, I've been making this recipe for several years now, but just realized that it's never made it to my blog. It's an Emeril recipe from over a decade ago and I pretty much follow it precisely except to omit a suggested pinch of nutmeg and substitute 1/2 and 1/2 for the heavy cream. The recipe calls for shallots, but if I'm out, I'll often use a bit of onions and garlic. 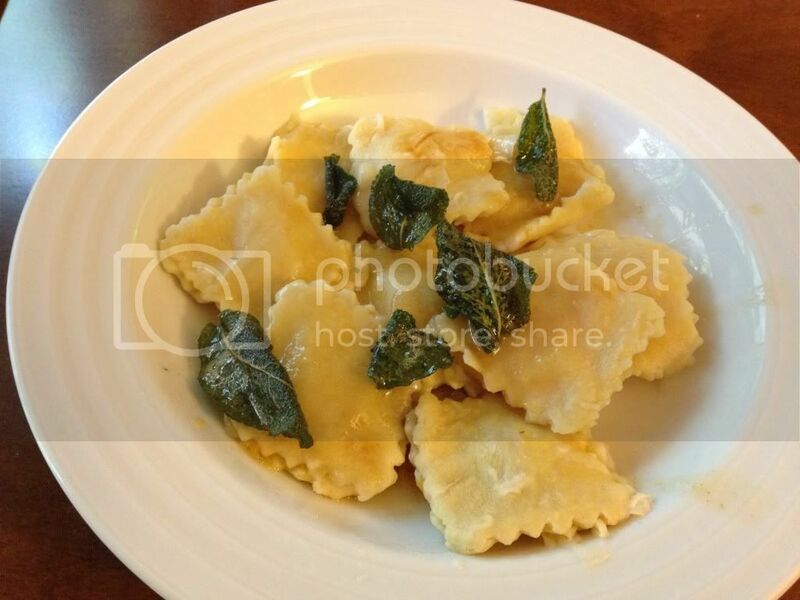 When I first started making this recipe, I used premade wonton wrappers for the ravioli dough. Then two years ago we moved to Virginia and the ones from the local grocery store tasted weird. Ever since, I've always made my own dough using another Food Network recipe. I have a set of pasta rollers for my KitchenAide mixer, but when I'm feeling too lazy to haul out the entire apparatus, I just use a rolling pin and we eat a little thicker pasta. A couple ways I speed this recipe along is to roast the butternut squash ahead of time and keep it in my freezer. Actually, for a good-sized squash, say 2-3 lbs, this recipe only requires half. So I might roast the squash, use half the same day, and freeze the rest to make the dish in another month. I'll also make the filling earlier in the day and chill it in the fridge till I'm ready to make the raviolis in the evening. That only shaves about 10 minutes of time, but eliminates an extra pan and chopping board. Pasta dough can also be frozen. Wow, that's a bit more blathering about a dish than I usually do. On to the actual recipes! As you can see, the pasta's a little thick because I used my rolling pin last night, but I did punch cute little ravioli shapes for you, which I wouldn't ordinarily do. To make the dough using an electric mixer, please see the original recipe for directions. My method is as follows: Mix the flour and salt together and dump onto a clean counter top, forming a mound. (You can use a large bowl too, but you'll dump it later for kneading so I just use my counter.) Make a well in the center (think volcano) and add all the eggs and 1 TBS of olive oil. Whisk the wet items together. Carefully draw the flour from the base of the volcano towards the well and incorporate the mixture together. In a couple of minutes, all of the flour should be incorporated and it shouldn't be too sticky. Keep kneading and folding the dough until it is smooth and elastic, about 10 minutes. (Note: if your dough isn't coming together, add a drizzle of water or more olive oil. Conversely, if it's too wet, you can add a little more flour.) Drizzle your ball of dough with olive oil and wrap in plastic wrap. Allow to rest for 30 minutes while you make your filling. To make filling, melt butter in large saute pan over medium heat. Add shallots and cook for 1-2 minutes. Add the squash and cook until the mixture is slightly dry, about 2 to 3 minutes. Season with salt and pepper. Stir in the half and half and continue to cook for 2 minutes. Remove from the heat and stir in 3 tablespoons cheese. Season again with salt and pepper, if necessary. Cool completely. To assemble your raviolis, roll dough out to 1/8" thinness or less. (Original recipe states 1/4" but it's simply your personal preference so long as the dough isn't so thin that it won't hold your filling). Cut into your preferred size of ravioli. The picture shows 1.5" squares, though I tend to make mine about 2 x 2" or larger when I'm free-handing cutting them. Drop about 2-3 teaspoons of filling per ravioli. Lightly wet the edges to seal the ravioli. Place on a sheet covered in parchment paper and freeze for 5-10 minutes. (This step helps them hold together). Cook raviolis in boiling salted water for about 3 minutes until they float to the top and are pale in color. Drain and keep warm. To make the brown butter sauce, melt 1/2 cup of butter in a saucepan. Add sage leaves and continue cooking until butter begins to brown. Remove from the heat. Spoon butter sauce over raviolis and sprinkle with cheese for serving.